The extensive view looking south from Skiddaw summit on a very clear winter’s day, towards Skiddaw Little Man. On this day I decided to do a late walk so set off in the afternoon and by the time I got to the summit it seemed I had the Lake District fells to myself. The walk back down in the dark was pretty straightforward as the snow illuminated the path so a torch was not required. What a great day out in the fells! 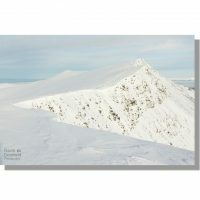 To buy a high quality print of 'Snowy View from Skiddaw Summit', either with or without a frame, please click the above button. All photographs are securely packaged before being dispatched and are subject to a 30 day money back guarantee should you not be entirely happy with your purchase. Should you have any questions please contact me and I will reply as soon as possible.